Six members of the Royals Organization are representing the United States in the Pan American Qualifying Tournament taking place right now in Puerto Rico. 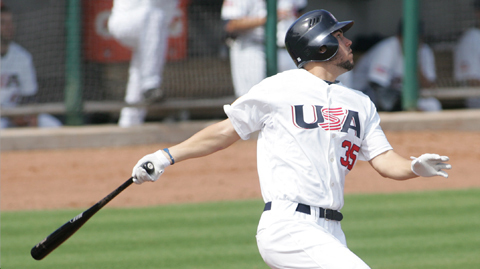 Team USA is undefeated through four games in pool play with the Royals prospects playing key roles in each win. Eric Hosmer (shown above) is leading the way at the plate. Hosmer was 3-for-4 with an RBI and run scored Tuesday (October 5). So far in the tournament he is hitting .364 with six walks, five runs scored and two RBI. Mike Moustakas is also hitting with (.294) with a home run and team leading six RBI. On the mound reliever Tim Collins (LHP) has been perfect in two outings. Everett Teaford (LHP) picked-up a win in his start with five shutout innings and ten strikeouts (Yes, ten strikeouts in five innings…no walks). Mike Montgomery also has a win after a five innings six strikeout performance. Danny Duffy (LHP) is also a member of the pitching staff and may be making the start tonight in the final game of the first round versus Panama (6:30pm CST). As you watch the MLB playoffs, be sure to keep an eye on Team USA and follow this strong contingent of Royals.